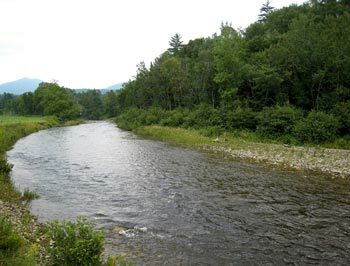 To conduct conservation activities related to the Passumpsic River and its watershed, with a focus on the recreational, educational, ecological, and historic assets afforded by these resources. 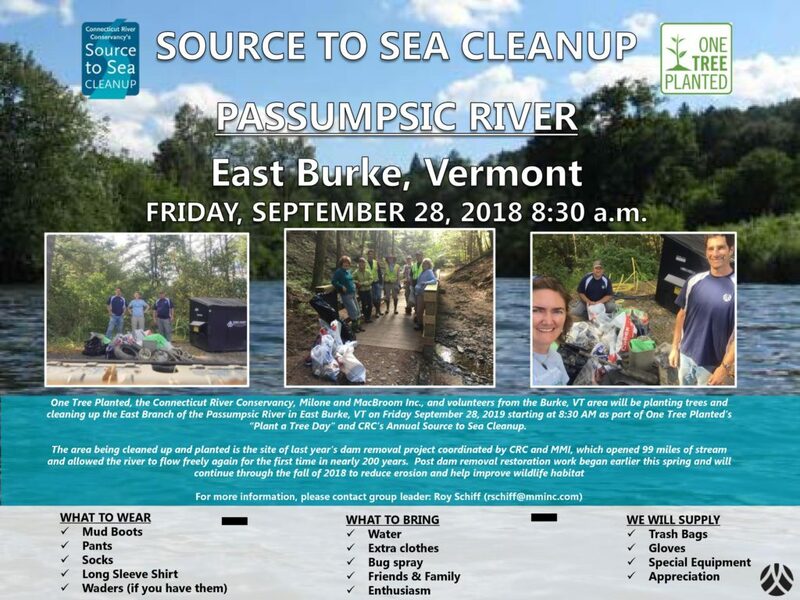 The Connecticut River Conservancy, One Tree Planted, and Milone & MacBroom, Inc. planted trees and cleaned up the East Branch of the Passumpsic River in East Burke, VT on Friday, September 28, 2018 as part of One Tree Planted’s “Plant a Tree Day” and CRC’s annual Source to Sea Cleanup. 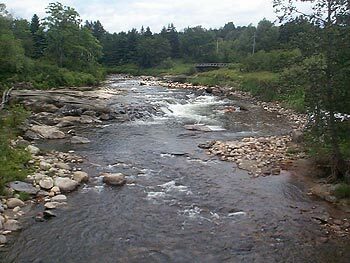 The area that was cleaned up and planted is the site of last year’s dam removal project coordinated by CRC and M&M, which opened 99 miles of stream and allowed the river to flow freely again for the first time in nearly 200 years. Post dam removal restoration work began earlier this spring and continued through the fall of 2018 to reduce erosion and help improve wildlife habitat. Thank you to all the volunteers who helped on our property and especially to M&M group leader Roy Schiff for organizing. The East Burke Dam removal is complete. Thank you to everyone who contributed to making it possible over the past 17 years. 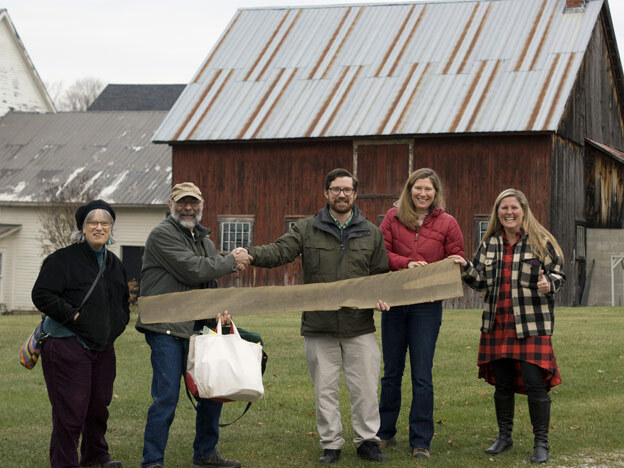 We would also like to thank everyone who came out to our May paddle through E. Burke in partnership with the Northwoods Stewardship Center and Connecticut River Conservancy. It was amazing to see kayaks and canoes passing the old dam site for the first time. We were honored to participate in the gallery show and talk in collaboration with the NEK Artisans Guild in St Johnsbury. The exhibit was titled "Water Is Life," and it ran from June 9-July 28, 2018. The Guild is located at 430 Railroad St.
We were especially happy for the talk with Grace Gershuny, on Friday, July 20, 2018. 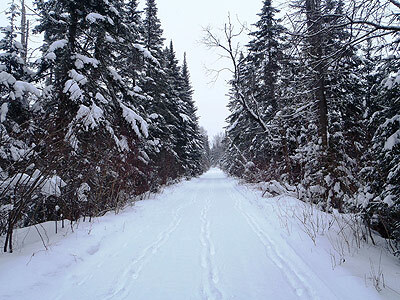 Grace is an author, member of the Vermont Healthy Soils Coalition, and a Barnet resident. She spoke on "Expanding the Soil Carbon Sponge for Water, Climate, and Resilient Communities" in the Guild's Back Room Gallery. Thank you to everyone who joined us for this important topic.